After seven years of litigation that spanned the globe, Apple and Samsung have definitively ended a patent battle launched after the US company accused its rival of "slavishly" copying the iPhone's groundbreaking design. 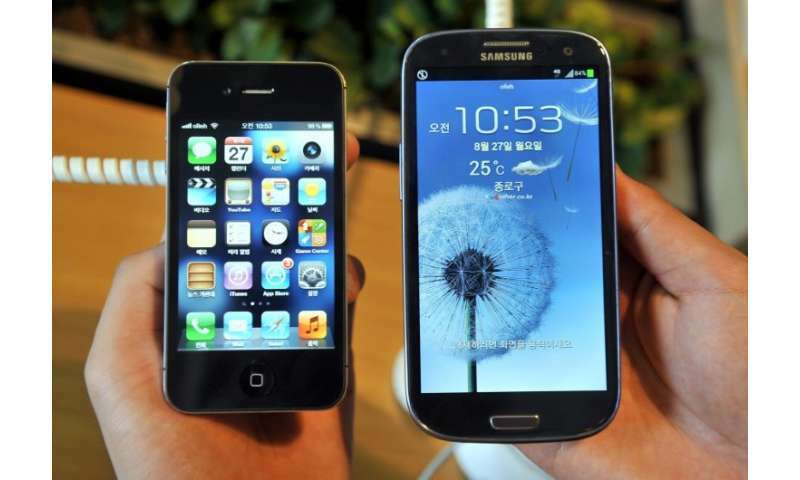 According to a brief US court filing Wednesday, the world's two biggest smartphone makers finally reached a settlement. Financial terms were not revealed, and neither company elaborated on the court order by US District Court Judge Lucy Koh which dismissed the litigation "with prejudice"—leaving no option of reopening the case in future. The deal came a month after a federal court jury ordered the South Korean consumer electronics giant to pay Apple some $539 million for copying patented iPhone features. That award was seen as a victory for Apple, which had argued in court that design was intrinsic to the iPhone, and so should enjoy protection as a whole against copycats beyond the usual patents afforded to hardware components. The US action was the first of dozens of lawsuits spanning Europe, Asia and Australia. The rival companies went head to head over what constitutes protected design in both the hardware and features of their phones and tablet computers. In the original US lawsuit filed in 2011, Apple said Samsung had "chosen to slavishly copy" the technology, interfaces and product design of the iPhone, which revolutionized mobile telephony when it was launched in 2007. As their tussle escalated worldwide, a lawyer for Samsung in turn accused Apple of behaving like a "jihadist" in its determination to fight on. But Wednesday's court order declares an armistice between the sector leaders, and legal experts said it was the inevitable outcome given the pace of change in smartphones since 2011. "The market has moved on, the designs have changed, so it becomes increasingly more difficult for anybody to validate any (patent) infringement," Ranjit Atwal, personal technology analyst at Gartner, told AFP in Paris. "There are more interesting battles to follow, and they are not necessarily going to be fought in court," he added. "The smartphone market is saturated—where do they find the next market, how do they move forward?" Apple insisted it was fighting for a core principle that design is so important to its products that it can actually be considered the "article of manufacture" under patent law. The three design patents in the case applied to the shape of the iPhone's black screen with rounded edges and a bezel, and the rows of colorful icons displayed. The jury had been asked to determine whether the design features were worth all the profit made from Samsung smartphones that copied them—or whether those features were worth just a small fraction because they are components. Apple was supported by big names in fashion and manufacturing, citing precedents such as Coca-Cola's iconic soda bottle. But Samsung won the backing of major Silicon Valley and other IT sector giants, including Google, Facebook, Dell and Hewlett-Packard, claiming a strict ruling on design infringement could lead to a surge in litigation. When contacted by AFP for comment about the Samsung settlement, Apple referred to a statement released last month after the jury announced the damages award. "It is important that we continue to protect the hard work and innovation of so many people at Apple." Samsung and Apple are back in court over iPhone design. Here's why.